You are on your way to Santiago. Do you take walking sticks or not? 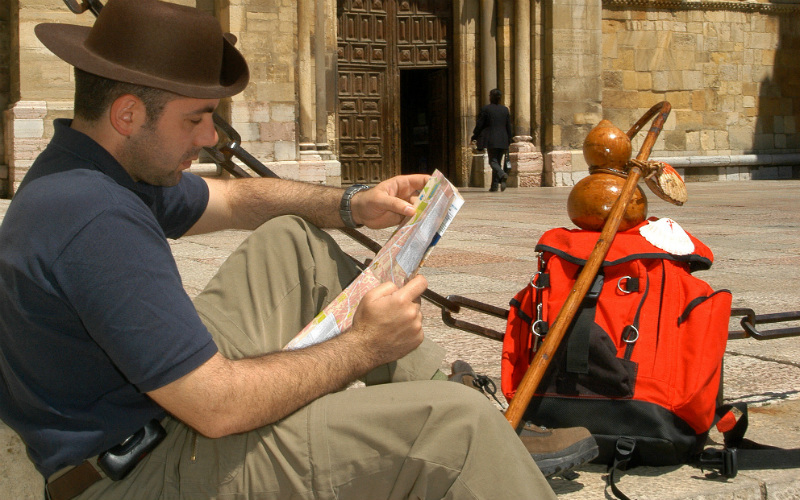 At Spain Is More we help many pilgrims on their way with their camino. And we get various questions about whether or not to use sticks. We list the advantages and disadvantages for you. To make walking easier. The walking stick offered extra support in the event of fatigue or overload and, in particular, on bad roads. The iron point the staff was used as a defense against bush robbers or false pilgrims and as a weapon against wild dogs and wolves. The pilgrim staff (latin: 'bascules') was a wooden stick, until the 14th century shorter than the height of the pilgrim, usually at the top of an apple-shaped round bud and at the bottom a wrought iron point. From the 15th century, the staff became increasingly longer and protruded above the pilgrim's head. In the middle there was a sturdy button with a handle underneath. At the top there were usually two round buttons, one at the top and a bit lower. From the 16th century, a fetch was often made between the two bulbs, in order to hang the drinking bottle, calabash, whip or scallop. You can now almost not go on the Camino without stumbling over pilgrims with sticks. The pilgrim's staff new style, where the practical reasons of 'then' have been slightly modernized. The roads are now better than in the Middle Ages and walking with two sticks is better for your body. In addition, it is not really necessary to protect you from highway men, wild dogs and wolves while on the Camino. Actually, the Camino is properly one of the safest places in the world. In 2010, the University of North. umbria (Great Britain) conducted a study in which 37 men and women were measured when climbing and descending Mount Snowdon. Half did it with trekking poles, the other half without. The result was that the group with sticks was less tired after the trip and had less trouble with tired muscles until three days later. In addition, the group recovered faster with sticks. When walking uphill they help a hand with the use of your arms. You can, as it were, 'push' yourself a little bit. You get less (or no) thick fingers or hands less quickly due to the continuous movement of your arms. You walk more upright, which is better for your back. It relieves the load on your ankles, knees, hips and back by 30%. The burden is your body weight + your backpack + the length of the walk you do. Particularly with a descent very helpful! You have more balance: not only during normal walking, but also, of course, during the moments when you literally need your balance to cross a river or during a difficult climb. Sticks also give you more confident. You should not feel ashamed awalking with sticks - almost everybody does it. These advantages are best when you walk with two sticks. Walking with 1 (wooden) stick may be historically justified but causes an unbalanced load on your body. There are of course also disadvantages. You will suffer from all kinds of body parts if you do not use the sticks correctly. You want your hands free to do other things (drinking, telephone, etc.). You (and many others) find the noise that the sticks make very annoying. For this purpose, special caps (rubber) are available. Walking with sticks is another way of walking. You will have to get used to it. You find it less tough. What do you pay attention to when you buy walking sticks? First you have to decide whether you want one or two sticks. This is very personal. Often the trekking poles are sold per set, but that is not necessary. It is also recommended to walk with two sticks because otherwise you get a skew load. You have a choice of different materials: aluminum is the most common. It is strong and light and also somewhat flexible. In any case, it is the cheapest choice. Titanium and carbon sticks are much more expensive but lighter and stronger. The weight cannot be unimportant if you take the walking sticks with you on a multi-day hike where every gram is important. The trekking poles are extendable to make them the right size. The stick then consists of two or three parts. With two parts you have to adjust less and there are also less vulnerable blockers (slide or clamp). With three parts, the packing volume of the sticks is smaller. This is useful if you want to take them in or along your backpack or in your luggage on the plane. Then there is the handle: that should be nice in the hand and not burden your wrist. For most people it feels the best when the handle is thicker and narrower down, oval and slightly forward. Also note the material on which the handle is made. Hard plastic is not fine. Softer materials feel more pleasant. What is the correct length? When purchasing, you also have to take into account the stick length. You find the right stick length by standing up straight and keeping your arm in a ninety-degree angle. The distance from the ground to your hand is the correct length. Most trekking poles have an adjustable length of 110 to 140 cm. Ladies' poles are obviously smaller. An additional advantage of making the poles to length is that you can adjust the length in the mountains to what you do. When you descend you make the stick a bit longer and when you go up it is a bit shorter. Conclusion, walking with sticks has a lot of advantages. It is better for your energy and your body. But you should use them well to prevent other injuries. What is best for you; it always remains personal. So if you have the opportunity, try a few times how it feels to walk with sticks for you! Take your first step to your camino here!